Just like a healthy garden, a healthy ocean floor has worms and other animals that move through, ingest and affect the characteristics of the ocean floor sediment. This process is known as bioturbation. In this installment of Word Wednesday, we will explore this process of bioturbation, who are the key players, what they do and why this process is important. In our garden, earthworms burrow up and down in the soil creating tunnels and breaking up clumps of soil. This tunneling provides greater oxygen and water to plant roots. In addition, earthworms also ingest (eat) the soil itself, digesting the nutritious microbes (the organic part) and detritus (non-living organic matter) and egest (poop) the mineral (or inorganic) portion that we call castings. These castings are rich in minerals such as nitrogen, phosphorus, and calcium that plants need to grow. In the oceans, bioturbation is done by a variety of animals, including all kinds of worms, clams, amphipods, sea cucumbers, and even the microscopic foraminiferans. As an aside - did you know that out of the 36 or so major groups of animals (phyla), more than half are commonly referred to as worms (spiny headed worms, segmented worms, arrow worms, roundworms, flatworms, acorn worms, ribbon worms, horsehair worms, peanut worms, and on and on…). 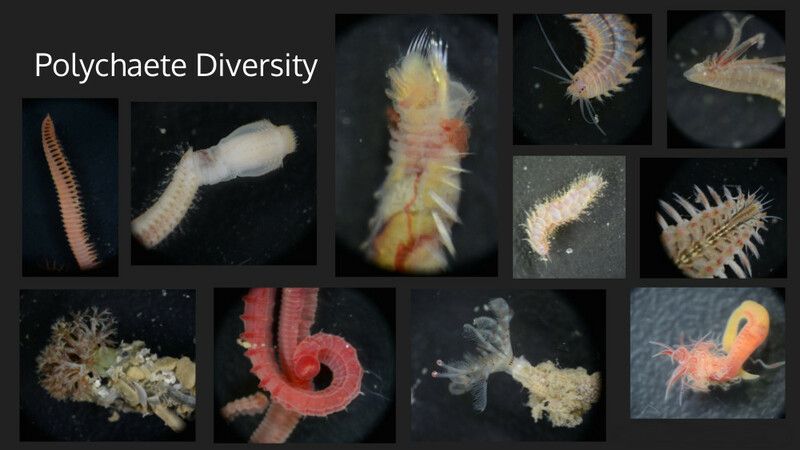 The picture at right gives just a glimpse of the amazing diversity within just one taxonomic group of worms, the segmented worms. There have been a variety of methods used to study bioturbation, including the use of glowing beads, but that’s a post for another day. However, these studies do show that the highest rates of bioturbation come from infaunal (as opposed to epifaunal) organisms. They also show that bioturbation is extremely common in estuarine and marine environments and can reach more than a meter deep into the sediment. Evidence also indicates that this has been the case for millions of years: we can see traces of bioturbation, described by the German word lebensspurren, (translated literally as “life trails”) in fossilized sediment. 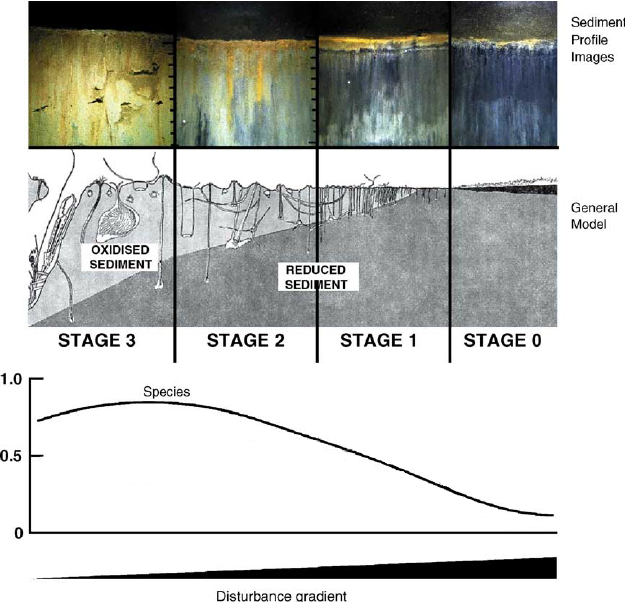 Sediment profile image. Source: Biological Assessment for the Port Jersey Shallow Water Restoration - USACOE NY District 2003. As in our gardens, bioturbating animals affect sediment properties by their feeding, burrowing, tube building and other day-to-day activities. Bioturbation can change physical properties of the soil such as water content, degree of compaction, size of the sediment grains and its susceptibility to erosion. It can also change the chemical properties of ocean sediment such as oxygen levels, layering or microstructure and rates of exchange of many compounds from or to the overlying water. Bioturbation can also affect the abundance and type of other species in the sediment habitat. The effects of bioturbation thus profoundly affect the structure and function of the benthic habitat. The implications of bioturbation can be very important for management of the environment. For example, to reduce the effects of polluted or contaminated sediment (in aquatic environments) that cannot be removed for ecological or financial reasons, it is often capped with clean sediment to prevent the spread of the pollution or contaminant. If bioturbating organisms are present, the thickness of the cap must be greater than the depth of bioturbation. 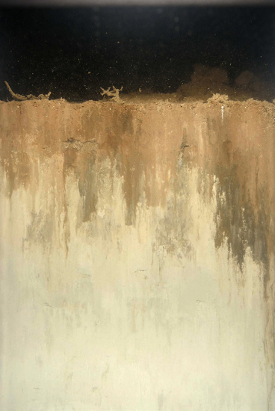 Interestingly, in this technique of in-situ capping, the cap layer of clean sediment is called the sacrificial layer: it is sacrificed to bioturbation! The ACER benthic macroinfaunal group is investigating the rates and effects of bioturbation on seagrass, marsh and bare mud bottom habitats contaminated with oil from the Deepwater Horizon oil spill. In the 70’s, benthic scientists developed a conceptual model that relates the composition of the benthic community and the amount of bioturbation to the degree of disturbance (with pollution being a form of disturbance). This model predicts that pollution will decrease the rate and depth of bioturbation as well as the diversity of bioturbating animals. After the Deepwater Horizon oil spill, oil that sank to the benthic environment was buried in the sediment by deposition and bioturbation. Bioturbation may have also brought that oil or its breakdown products back up to the sediment surface. But deposited oil may have also affected the degree of bioturbation in the sediment. Thus, a possible impact of the oil spill will be to alter rates of bioturbation, affecting the physical, chemical and biological characteristics of the benthic environment and thus affect the resiliency of the seagrass, marsh and bare mud bottom habitats.